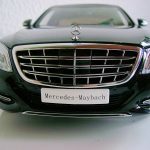 Mercedes Benz has not tried to “resurrect” the Maybach as its own brand a second time after they had so miserably failed to keep it alive at the beginning of the millennium. 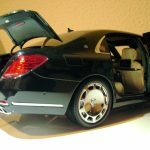 It was then conceived as being too similar, merely a blown-up version of the S-Class and therefore rejected by customers in favour of Rolls Royces or Bentleys. 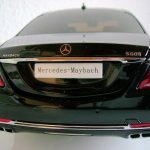 This Maybach here is an S-Class and uses the name to sub-brand the highest trim line of the Mercedes S-Class. 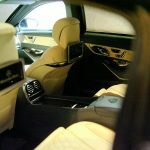 It is deliberately kept less ostentatious than the cars the Maybach 62 and 57 tried to compete with, but proudly claims to do some things like sound insulation better than its rivals at a very competitive price. 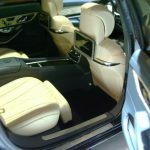 In fact, it is a bit of an understatement, as most onlookers won’t immediately spot the difference to an S-Class – and it’s meant this way. 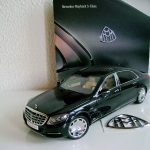 The Almost Real Mercedes Benz Maybach S600 does not so much compete with Bentleys and Rollers by Kyosho (although they do stand up to them), but directly challenges AUTOart’s Mercedes Benz Maybach S600 reviewed here at DiecastSociety.com earlier. So I tried to take some of my photos at the same angles as in the AA review to draw the comparisons that must be drawn between models that clearly compete to depict the same car. First things first, the Almost Real is all-diecast (except for the usual bits of course) and not “composite” like its rival. Yet, it is surprisingly light for its massive size. We were once told by AUTOart that composite was the step forward to achieve tighter shut-lines and panel gaps, not a cost-cutting shortcut. I am staring hard at both my pics and the other review, but honestly, I can´t see anything worse on the Almost Real. 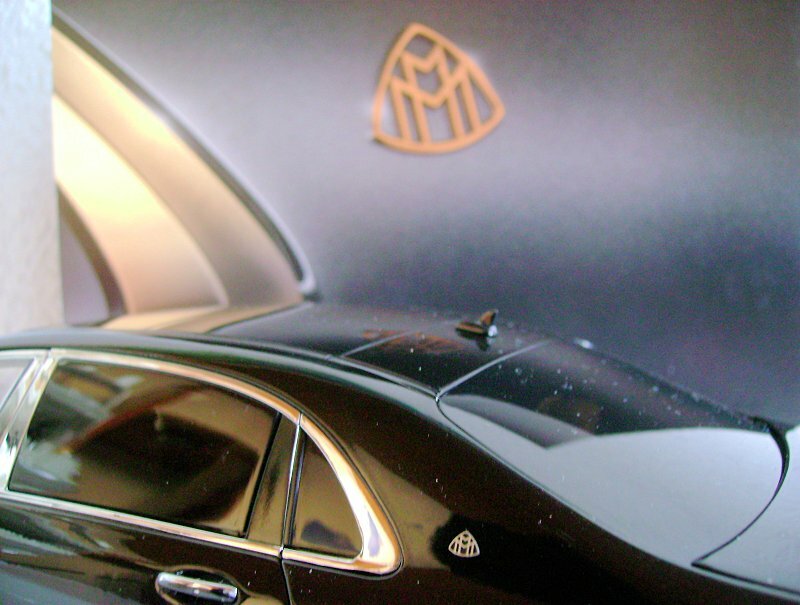 Of course, there is the colour-difference, the AUTOart being in a punishingly revealing white, whereas this first Almost Real release of the Maybach Merc is black with a white one following later. The paint itself is applied smoothly with tiny metallic flakes that only show in intense light, no flaws there. 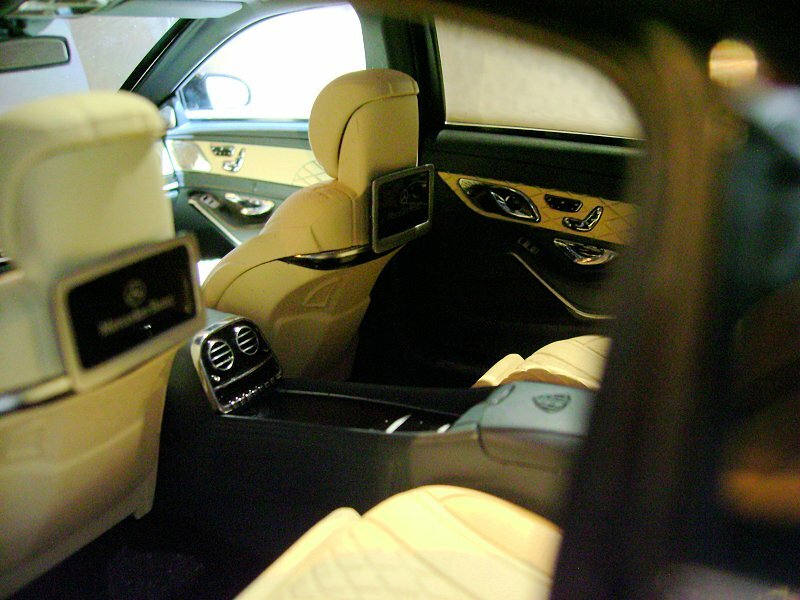 One thing that sets the Maybach apart from the ordinary S-Class is the chrome trim around the windows. 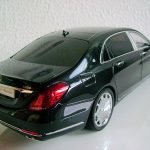 This is really high-gloss shiny chrome on the Almost Real model, like on the radiator, the exclusive Maybach rims etc., whereas it is only a matte silver paint on the AUTOart. The door handles are, as they should be, completely chrome on the Almost Real Benz, where AUTOart has inexplicably chosen a car colour handle with chrome top. 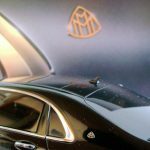 Like on the AUTOart we prominently find the Maybach double-M-badge on the C-pillar, but only the Almost Real rendition gives us the V12-badges between front wheels and doors to tell us about the engine under the hood that propels the 2.2-ton-barge to 100 kph in 4.7 seconds and sees it beneath the vehicles dignity to exceed 250 kph. 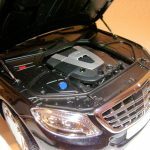 When you pop the hood of the Maybach-Merc, little is to be seen of the engine as it is all covered as usual these days. The Almost Real does not stand out on this, but the more on the fact that in contrast to the AUTOart it does open on struts. Well-done! 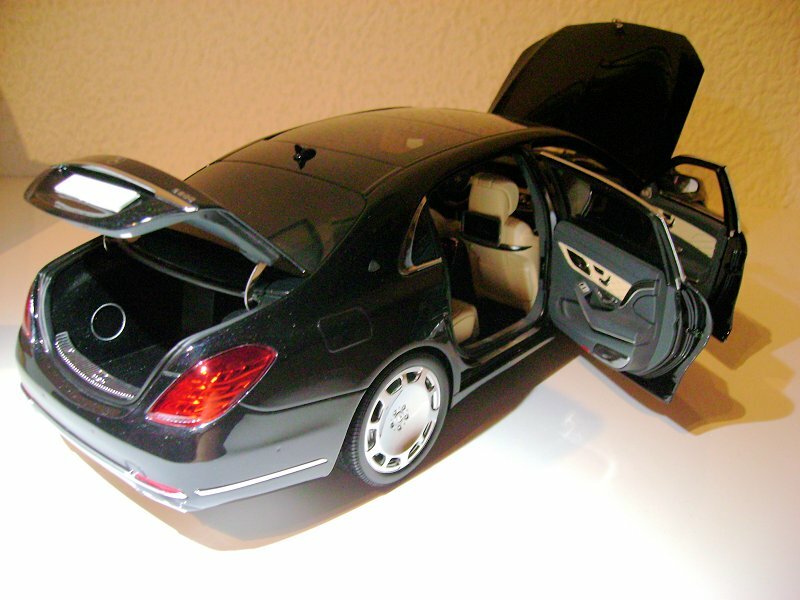 You get a similarly good impression from the way the trunk opens: AUTOart’s less than scale-accurate screws to fix the boot-lid to the hinge are completely absent from the Almost Real. Shaming the AUTOart again, the Almost Real has not forgotten the Burmester-premium-sound-system’s subwoofer-speaker inside the carpeted luggage compartment and the lid’s inside-trim has details, where the AUTOart doesn’t. The goodness goes on as we continue and open the doors to access the cabin. 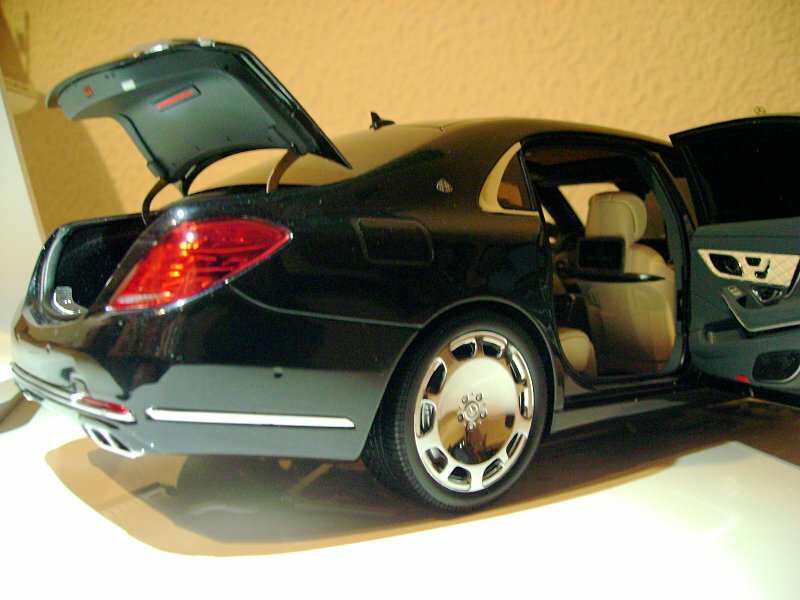 On the threshold, you are welcomed by a door sill guard that reads “Mercedes Benz”. 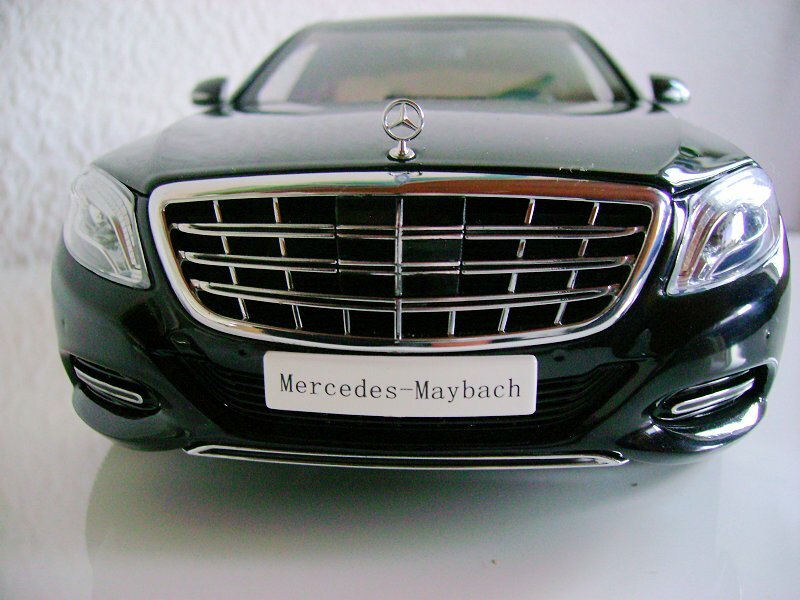 The AUTOart wrongly has “Maybach” instead. 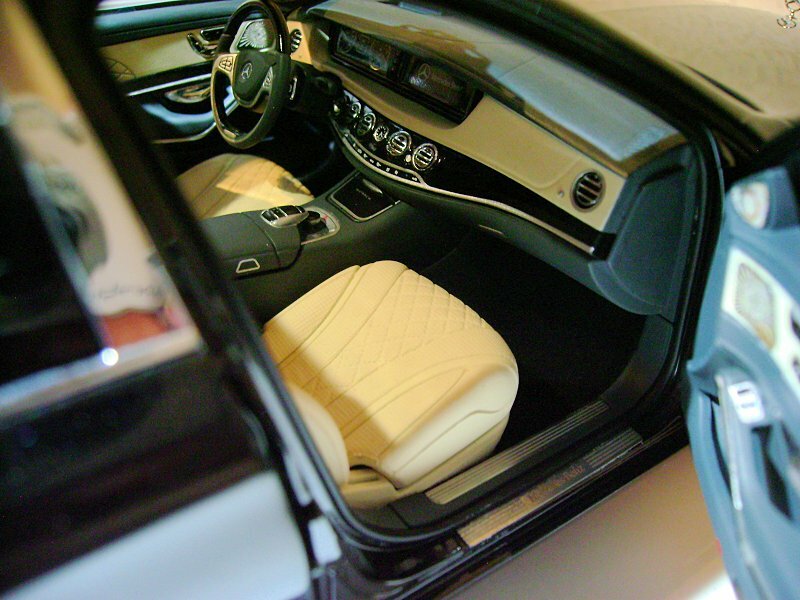 Again, the door trim has all the Burmester-speakers finished in shiny chrome, probably photo-etched pieces, doing the original justice, whereas the AUTOart has the same greyish dull silver paint as on the outside window frame trim. 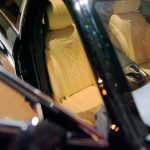 I find the quilted leather pattern on the seats and the trim softer to the eye and therefore more convincing, too than on the AUTOart whose clear sharp diamond pattern has you fear that this pattern will be embossed into the occupants’ bums. 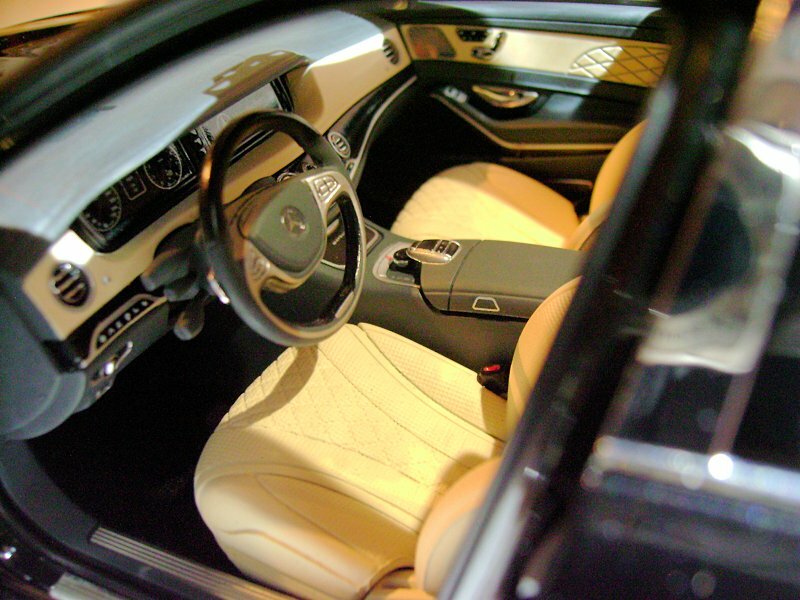 Only the V12-badges on the front seats seem a bit too subdued and could stand out more, like on the AUTOart. 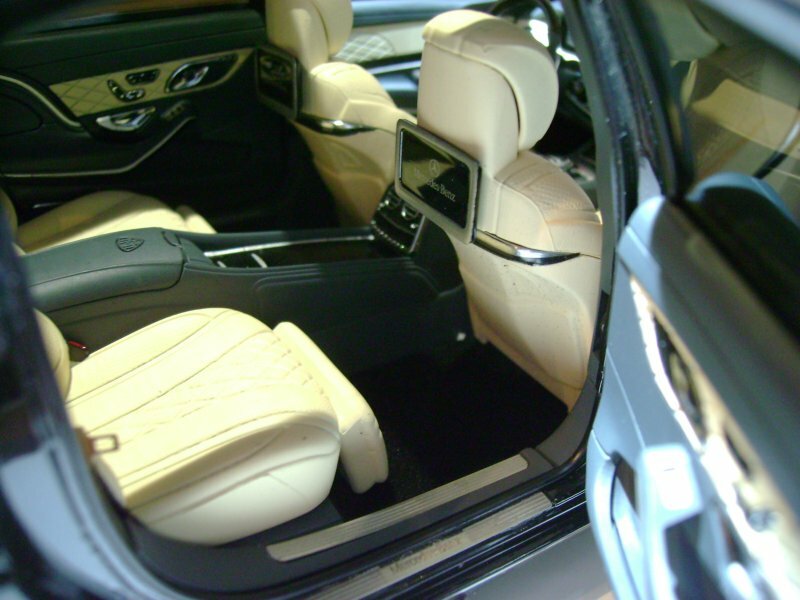 Of course, the interior is fully carpeted and all the details, like buttons, fabric seat belts with photo-etched buckles and belt-locks, etc. are there. 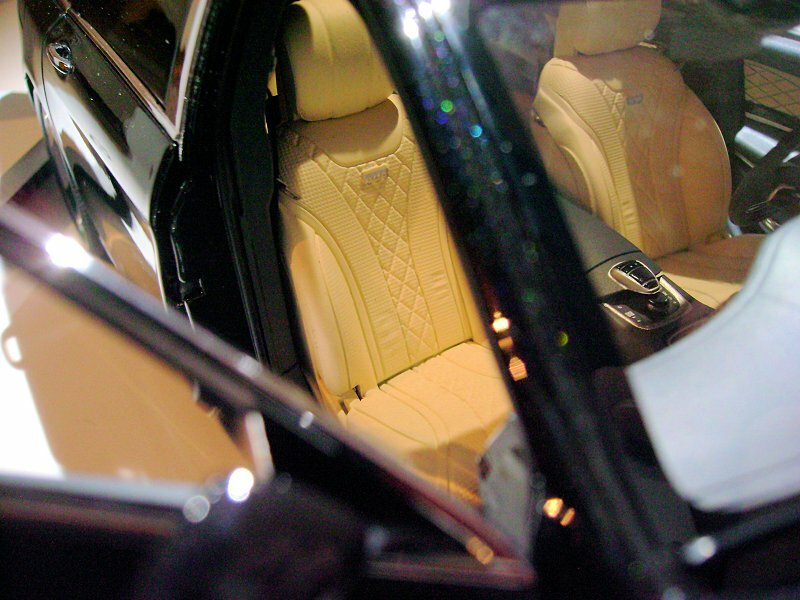 The rear armrest has the Maybach emblem and looks as if you could open it. 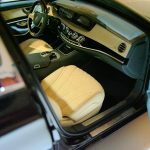 At the sides of the front armrest, unlike AUTOart, Almost Real have not forgotten the trapezoid handles to open the lid. 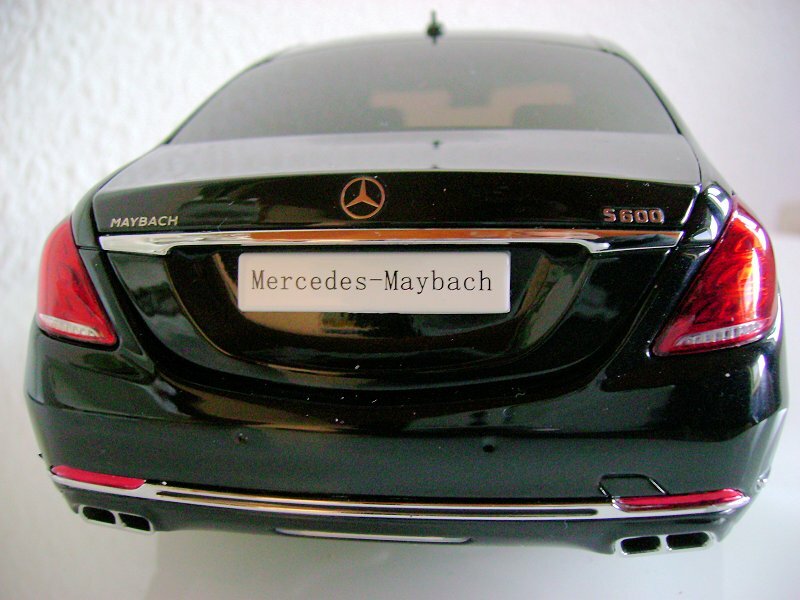 To impartially do a bit of justice, there is one thing I do like better on the AUTOart: Almost Real does not achieve the same depth on the tail lights IMO. Other than that the Almost Real model shames the more expensive AUTOart that seems complacent in its omissions, shortcuts and mistakes where Almost Real literally and metaphorically shines while not crossing the 200 EURO threshold. Indirect competition AUTOart has been dethroned and shamed by its rival. With the AMG GTR announced by both manufacturers, you can guess that Almost Real will continue to steal AUTOart´s crown so that I personally will always prefer the Almost Real over the AUTOart. 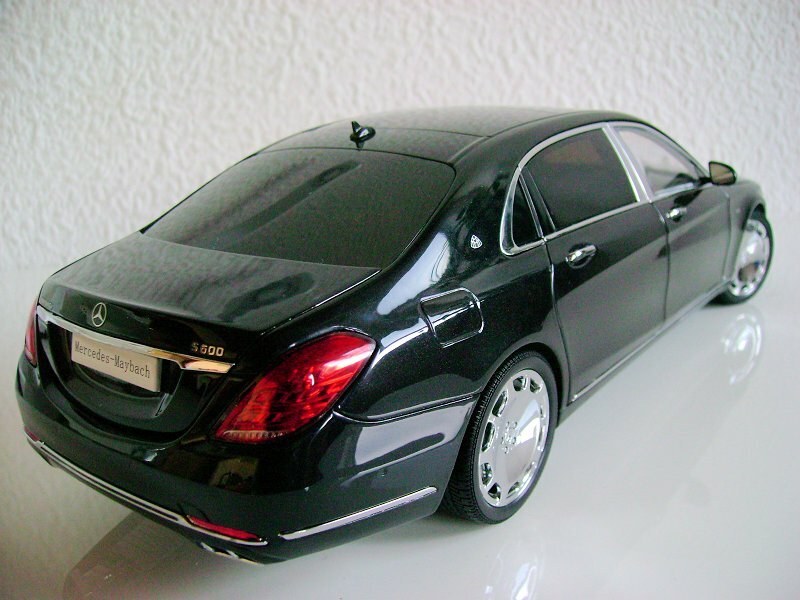 Perhaps it will wake AUTOart from its complacency and remind it of the greatness in diecast they were renowned for. Almost Real has proven that it can still be done without a hefty price tag. For those for whom after the “trucks”, this serene luxury barge still is too tame an animal: Almost Real will make its evil brother, the Brabus Rocket 900. Meanwhile, enjoy the pics to water your mouths. 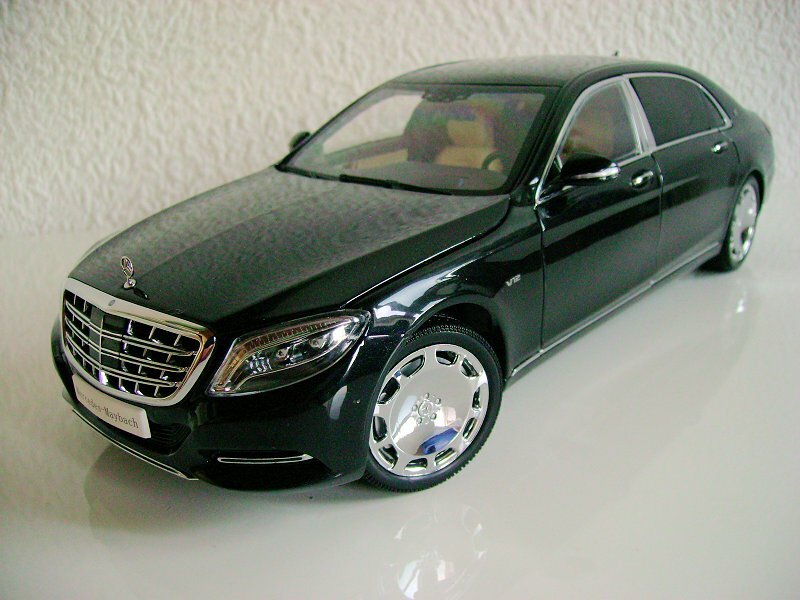 12 Responses to "REVIEW: Almost Real Mercedes-Benz Maybach S600"
Karsten, awesome review. It is nice to hear the feedback from one who has touched both Almost and AUTOart. Based on your observations Almost Real is the clear winner, but is it the cheaper of the two? In Europe definitely “yes”: Prices range from 188 to 209 EURO, whereas AUTOarts are 240 to 260 EUROS. Food for thought! 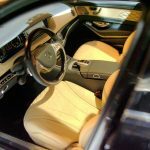 I’m not a fan of these luxury cars, but having owned the G500 4×42 from Almost Real, and now that I’ve seen this review, I think I might have to reconsider adding the Mulsanne Speed from these guys. My most favorite modern European luxury limousine of all time. I’m still patiently waiting for the review of the Julibee state limousines and Scale Figures figurines, Mr. Weiss. Apologies, Hughes, I´m afraid DS don´t want to publish the reviews of the State Limousines. I have already submitted them. So I´m not sure about the Scale Figurines. But I have the Kengfai Lykan, the Cult Scale Jaguar XJs and the BBR F12 tdf on preorder and announced for this month if this is any consolation. WHHAATT? Like really? Why though? Now that’s not fair. Well, I guess it’s my turn to say sorry, for both of us. For the XJ, which model did you order? The Series III or the XJ40? Actually, you know, whichever model is fine, as long as it’s a classic. The only letdown was the fact that it’s sealed resin. So please, do a review on that one. And thank you very much in advance. 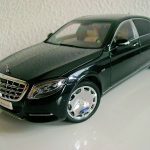 Apparently, the Jubilee Limos are not recent enough to be of interest, but if you use my contact form on my website, I´ll let you have the reviews – exclusively for you. The XJ40 is an older model and I have this in my collection for quite some time now (check out my website). What I have on preorder are the 1983 Series III and the X300. LS are making the Series III, too, but as 1982 XJ6 and in LHD. 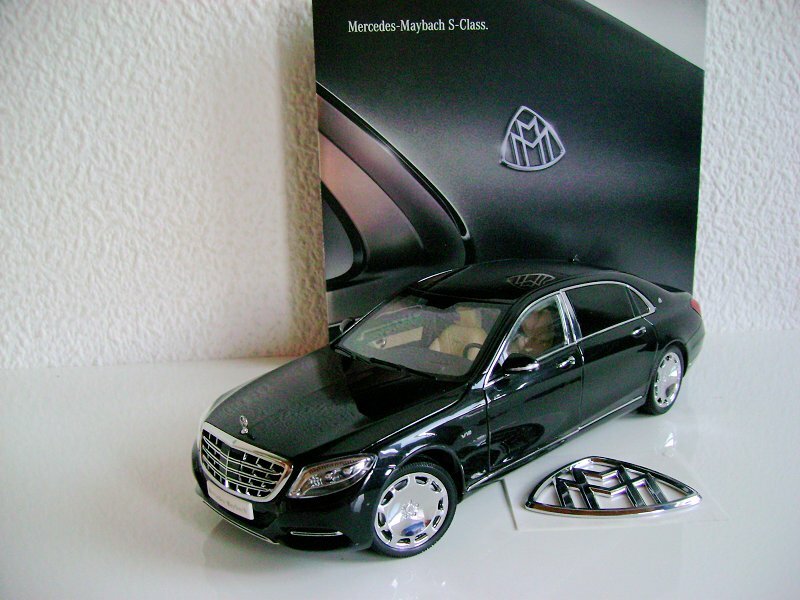 Superb model-making at a very reasonable price. 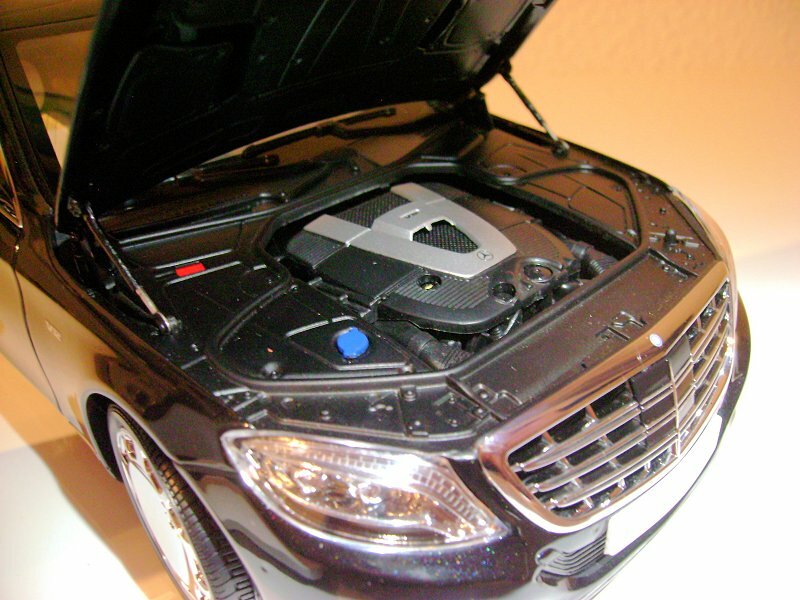 Better, and still cheaper, than recent Autoart Signature models. I don’t like the car itself but when AR release their Mulsanne Speed and P1 GTR I’ll be buying them in a heartbeat. I really hope they’ll start releasing some modern race cars in 1/18 too; they have plenty in 1/43 but that market is served exclusively by sealed models in larger scale. 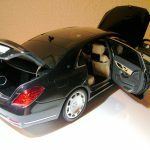 Great review, and comparison with old and new AUTOart versions. In fact, Almost Real are/will be making very few German brands: Bentley, Land Rover, McLaren are all British, the future Pagani is Italian, only Mercedes/Brabus are German. Of course with a quality like theirs, everone would want their favourite subject to be made by them. And @ Roberto: The individual collector really only needs one model of each car, the best; what my review/comparison aims to show, though, is that we do need the competition to keep manufacturers on their toes.